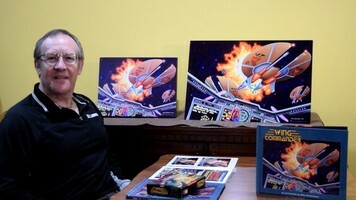 Artist Mike Winterbauer's Wing Commander Art Portfolio campaign came to a successful conclusion this week. The project collected $3,986 from Wingnuts who are passionate about classic WC art. Mr. Winterbauer will now go on to produce his behind-the-scenes look at painting the SNES Wing Commander box as well as create a variety of very cool collectible displays. We can't wait to see them in person! Here he is with the mockups! WOW! The last 24 hours of the Wing Commander Art Portfolio were amazing! The campaign really picked up and we ended up being almost 800 percent funded! Thank you all for your awesome support and I look forward to getting the rewards out as soon as possible! Thanks! !